Enjoy warm weather outdoors at one of North Dakota’s many great public golf courses. When the sun is shining and you’re looking to unwind, a round of golf on a beautiful day is invigorating. If you’re looking to hit the greens in North Dakota, you would be wise to test your skills at these nine excellent public golf courses in the state. This 18-hole, Par 72 championship golf course takes advantage of Bismarck’s landscape to create a course that is as challenging as it is beautiful. According to golfers, the 18th hole is a particular challenge, as the long par 5 finishes with a 150-yard uphill battle, especially if the wind happens to be against you. Located on the banks of beautiful Lake Sacajawea, The Links is considered one of the most majestic courses in the state. Much of the original soil was left intact during construction, giving you one of the most authentic golfing experiences around. The course includes five sets of tees, ranging from 5,249 to 7,092 yards. An Arnold Palmer signature golf course, King’s Walk was designed to mimic the courses found in Ireland and Scotland. The 18-hole course is intended to challenge golfers of all skill and experience levels. The course also includes a driving range, target greens, and putting and chipping greens. Few places highlight the beauty of North Dakota like Medora does. The 18-hole course features five tees, ranging in length from 4,750 total yards to a challenging 7,166. Bully Pulpit also includes the “Badlands Holes,” holes 14, 15, and 16, each of which takes golfers through a rugged fairway gorge. The newest golf course in North Dakota, Medicine Hole features a variety of elevation changes, water hazards, and nature-made tests. Located in picturesque Kildeer, few golf courses off the combination of challenge and beauty that you will find at Medicine Hole. Information about weekly and monthly special events can be found on their website. One of the state’s oldest golf courses, Edgewood is also one of its most popular. It is the only tree-lined course in the Fargo/Moorhead metro area and give golfers a unique set of challenges particular to this course. 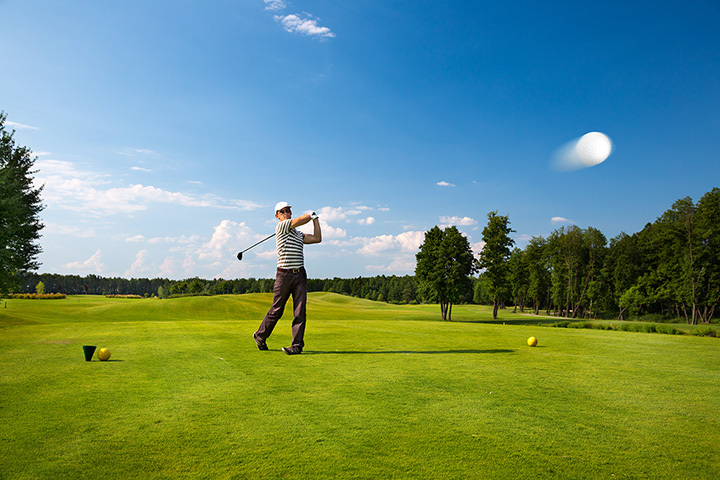 The 18-hole, par 71 course will surely push you to your limits and bring out the best golf. The 18-hole course features 6,759 yards of golf from the longest tees for a par of 72. One of the most reasonably priced courses in the state, Souris Valley is the perfect course for beginners or those whose clubs have sat dormant in the garage for far too long. Another gem located in the Fargo metro area, Rose Creek is frequently voted one of the best courses in the state. The 18-hole course will be reduced to 11 holes to accommodate the building of Fargo’s flood levy. The full course will reopen as construction permits. Still, the course will give you a run for your money. This 18-hole, par 72 course is located along the Heart River and adjacent to the beautiful Patterson Lake. Heart River combines a rolling top nine with a wooded bottom nine to give you a challenging and unique golfing experience. Multiple tea boxes are available to accommodate a variety of skill and experience levels.